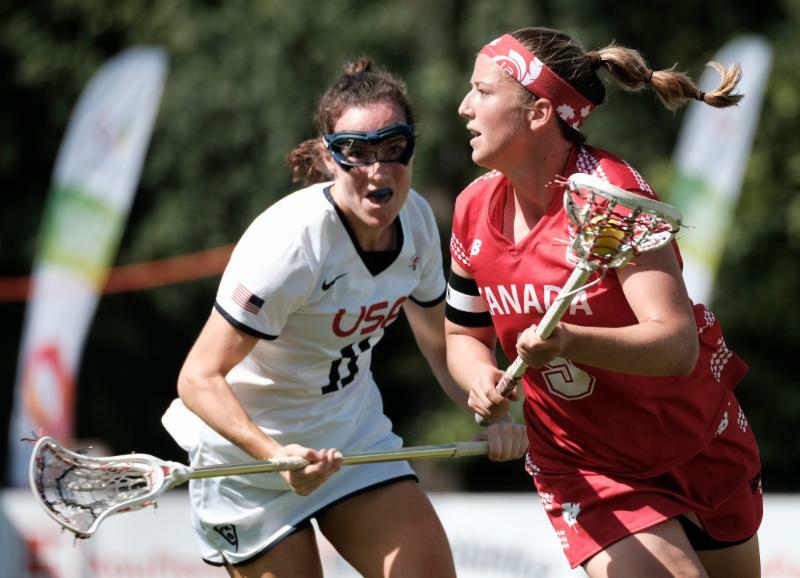 WROCLAW, POLAND – Canada will bring home a silver medal from lacrosse’s first ever World Games competition after coming up short in the final, losing 11-8 to the United States in front of a large crowd in Wroclaw, Poland. It is their second silver of the summer, falling to those same Americans in the final of last weekend’s 2017 FIL Rathbones Women’s Lacrosse World Cup in Guildford, England. The U.S. continued their dominance on the international women’s lacrosse stage, but if the World Games final was any indication, Canada is closing the competitive gap. “We are getting closer and closer to reaching our ultimate goal at the senior level,” added Erica Evans who finished the tournament with a team leading 18 points in four games. The Canadians got off to the quick start, with Evans and Dana Dobbie each finding the back of the net in the opening minutes of the game. The U.S. would draw even, and eventually take their first lead of the game, thanks in part to a hat-trick from Alyssa Murray. Canada’s Lydia Sutton and Kay Morissette, who scored with 13 seconds remaining in the half, helped cut into the lead, which stood at 6-4 entering the break. With momentum on their side, Canada struck quickly again to open the second half, with Evans and Morissette each scoring their second goals of the game to tie things up at 6-6. That’s when the offence went dry. The Americans got the next five goals, unanswered, by taking advantage of turnovers and pressuring the defense on the clear. Their potent attack, along with some help from a stagnant Canadian offence that went scoreless for a 22 minute span, helped them build an 11-6 lead. Dobbie and Tessa Chad each scored in the final five minutes of the game to cut into the lead, but the U.S. ragged the ball to kill off the remaining few minutes to capture the gold medal. The championship game brought an end to lacrosse’s inaugural World Games tournament, which was also the first time the sport was part of an international multi-sport event. The world, along with the with representatives from the International Olympic Committee, were watching and evaluating a sport that has been very vocal about its future Olympic aspirations. The potential to be played on the world biggest stage is something that excites national team veteran Dobbie. The future of the Canadian national team program is something that Evans, one of Canada’s brightest stars, is really looking forward to.